South Africa-based Cape Reed Group of Companies is showcasing its range of environmentally friendly and sustainable roofing systems at the ongoing Outdoor Design Build & Supply trade show in Dubai. 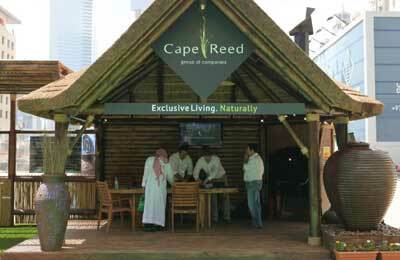 “The biggest benefit of a thatched roof certainly has to be the unique insulation properties that it offers,” said André van Heerden, managing partner, who was presenting the Cape Reed thatched roof at the inaugural edition of the fair, taking place at the Dubai International Convention and Exhibition Centre. “Every owner of a thatched roof house, bungalow, restaurant or gazebo will tell you how much cooler the structure is in the summer compared to a conventional roof, and because we use only FSC (Forest Stewardship Council) certified timber and natural cape reed thatch in our construction, the natural sustainability of our structures are excellent. “When we live in a concrete jungle there is nothing more soothing than to relax under a thatched structure. The natural materials blend with nature, becoming one with the environment,” he added. Thatching is the craft of building a waterproof roof with dry vegetation, creating a fully shaded structure constructed with natural materials. Van Heerden’s Cape Reed thatched roof presentation was one of many exciting new exterior design developments showcased at Outdoor Design Build & Supply, the Middle East’s dedicated landscaping and exterior design trade show, which opened yesterday and concludes tomorrow (March 27). Another example of ‘green roofs’ at the three-day event – which is currently hosting more than 100 local and international brands involved with the planning, design, and creation of outdoor spaces – is Vitaroofs, the Canadian company that has installed more than 1,000 green roofs internationally, including car manufacturer Ford’s world record River Rouge Plant, and the Vancouver Olympic Village. Consisting of grass, gardens, small trees, shrubs and all-round greenery, Vitaroofs’ roofing solutions are now looking to extend to the Middle East, providing custom green roof systems designed to thrive in extreme, hot climates, while also cutting down on air conditioning costs. “We’ve noticed that, over the past few years, the green movement has been growing exponentially in the city of Dubai especially. The launch of Outdoor Design Build & Supply demonstrates how the city is beginning to lead a new and positive attitude towards sustainability in the GCC region.